Options: Map pocket, cup holder, foot rest, embroidered logo on headrest, many color options for materials and stitching. 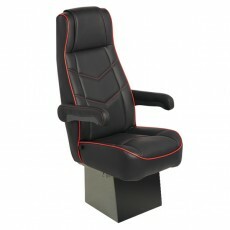 Available in single-seat and double-seat configurations, with both reclining and rigid options. Premier seating offers a number of available options for shuttle seating for vans and buses. Call one of our seating specialists today for pricing and to find out how we can exceed all of your expectations.